Advanced formulation VPS impression material offers premium performance at an economy price. Excellent flow characteristics provide better surface coverage, capturing great detail beyond the prepared margin. Easy to extrude and ultra hydrophilic with a patient-pleasing berry flavor. Working time of 1''25" for rapid set and 2''15" for standard set. Setting time of 2'' 10" for rapid set and 4'' 30" for standard set. Contains: 2 x 50ml cartridges, 6 mixing tips, 6 intraoral tips. Contains: 60 x 50ml cartridges. Contains: 2 x 50ml cartridges, 6 mixing tips. Genie was evaluated by 30 consultants in 556 uses. This VPS impression material received a 91% clinical rating. 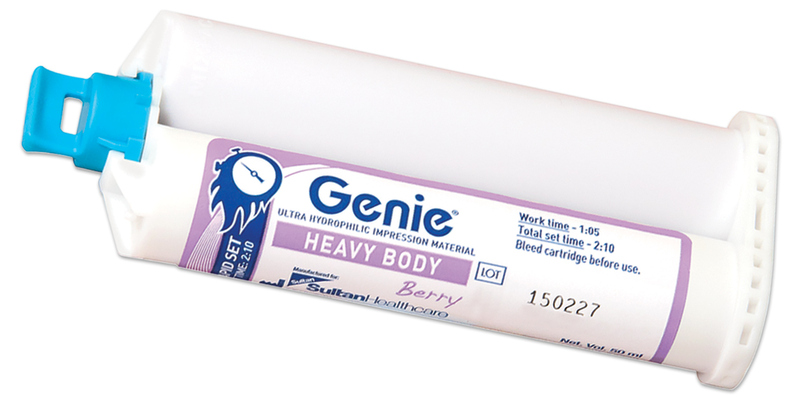 Genie is a system of VPS impression materials available in two setting times and five viscosities. Both the rapid set (2:10) and standard set (4:30) materials were evaluated. Genie, used mainly in crown and bridge applications, is rated as a very good impression material. Dental assistants commented on the easy mixing of the putty and smooth extrusion of the tray material. The color contrast between the light body (green) and tray material (purple) is excellent. Blending of the two viscosities was seamless yet easy to distinguish by color. Many consultants found that Genie performed similarly to their current material, resulting in often flawless impressions. The fast-setting material was preferred in most cases. The light berry scent and taste were well received by patients. 17% of consultants reported that Genie was better, whereas 53% reported it was equivalent to their current impression material. 43% would switch and 83% would recommend it.